How I’ve been trying to improve my figure drawing | Cynthia, inside. I’ve always been frustrated with my figure drawing skills (or lack thereof) and, until recently, have been getting away with “charmingly” distorted figures as popularized by indie comics and fashion illustration. For example, the figures in my work for Ang Nawawalang Soundtrack obviously defy human structure logic. That kind of drawing is acceptable, yes, but I am married to a very skilled artist who always tells me that I have to know anatomy before I can deviate from it. Remember, even Picasso had a realist period before the creative genius revolutionized the art world with his abstract depictions of society. So I made it my mission to practice drawing figures whenever I can and this is how I’ve been doing it. 1. I hang out in coffee shops where I can watch people and draw them inconspicuously. I usually sit in a corner where no one can see me drawing or else they might shy away and turn their backs on me. 2. I’ve been attending life drawing sessions such as Who Are Maro’s Life Drawing Setup. The session is divided into two halves — one for the male model and another for the female model. Each half is divided into 5, 10, 15, and 30-minute pose sessions so it really trains the artists to draw what they see without overthinking it. Arnold and I have been attending almost regularly since last year. You can follow their FB page to find out when the next one is. Here’s a video of my drawings from the latest one. The first time we joined I just used pencils. The following time I used watercolors, and for this most recent one I used Viarco graphite sticks and tailor’s chalk from ArtWhale. Using different mediums is training me to think and act quickly before the minutes are up and the model assumes a new position. 3. I watch gesture drawing videos on YouTube. The artist Proko’s human anatomy playlist is definitely a good starting point as he demonstrates drawing, explains bone joints and describes muscle groups in an entertaining way. 4. Sometimes I use Arnold’s action figures to study anatomy. The Final Fantasy XIII figures (which he has a complete set of, lol) are *gorgeous* and I like to pose them around so I can use them as models. They’re also great for studying lighting. My figure drawing is still very much a work in progress but I hope this post has inspired those of you who are also struggling to get figures done right. 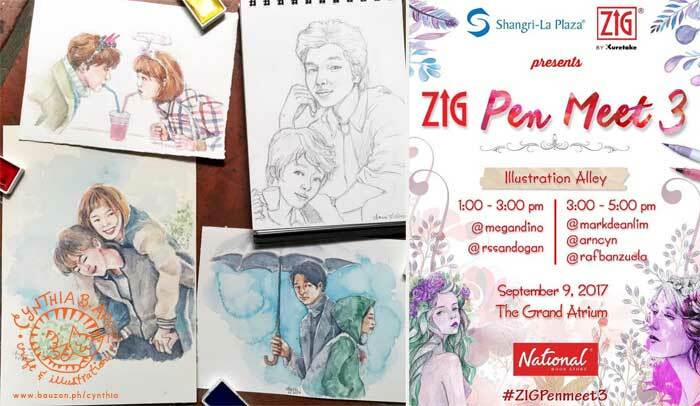 By the way, if you guys aren’t doing anything this Saturday, September 9, I’d like to invite you to come to the Kuretake ZIG Pen Meet 3 at the ShangriLa Plaza. I’ll be there among around 50 artists who’ll be doing live art. My slot is from 3-5pm and I will be at the “Illustration Alley” section. Not sure what I’ll be drawing yet but for sure I’ll be doing it in watercolors. Hope to see you then!